Find here Easterly Furniture coupons, deals and vouchers. Easterly is a unique furniture and homewares store. It has been inspiring homes across Australia since 2012. What began as a small family business in Torquay founded by Jon and Cherryl Morrow, is rapidly turning into a fast-paced environment, penetrating markets across all of Australia. With a new showroom opening in Torquay featuring new products and a bigger space, Easterly is set to grow even further. is not until you step inside and realise the diversity that Easterly offers to the surf coast. With the launch of Easterly’s brand new showroom, the range of stock and coastal aesthetics is something of awe. 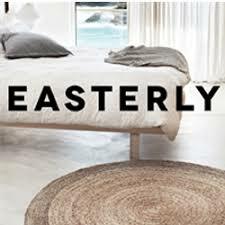 From some of the best brands around Australia and the world; Easterly stocks the complete Armadillo & Co Rugs and Table Top collections, eco-friendly and simple Ethnicraft products, Award winning and elegant Tessa and inspirational furniture from Uniqwa Furniture Collections. Easterly offers locally custom made sofas, some of the best handmade premium sofas in Australia as well custom dining tables to suit any home. Whether you are after giftware, faux plants, clocks, homewares and delicious furniture, Easterly is the place for you.